Opportunity, installed June 23, is roughly a hundred paces west of the Howard Administration Building, and stands adjacent to Founder’s and the Science Green. The 6-ft. circular structure of steel and glass has been described by Division of Visual Arts Chair and Professor of Art in Ceramics Dana Tupa as “a celebration of looking ahead.” It is on long-term loan from West who graduated this past May with a BFA in Sculpture and Ceramics. This latest addition to JU’s beautiful campus made its debut at the Juried Student Exhibition in November 2017, where West took home first place in 3D sculpture. Due to its sea mist color, smooth lines, and reflective glass center, the design inspires onlookers, especially students, to search beyond the present. So, the title acknowledges the incredible opportunities the future may hold. Her work has whimsical qualities that incite the imagination and often incorporates a visionary theme. The 5-ft. by 6-ft. ceramic tile mural features various species of the St. Johns River. 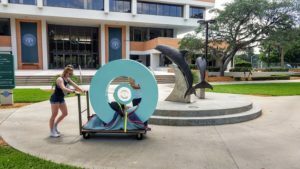 Soon to be installed at JU’s Marine Science Research Institute (MSRI), it joins the University’s growing collection of public art. Gonzalez hopes the piece inspires younger viewers, MSRI students, and river advocates. Furthermore, she hopes for increased investment in the future of the river. 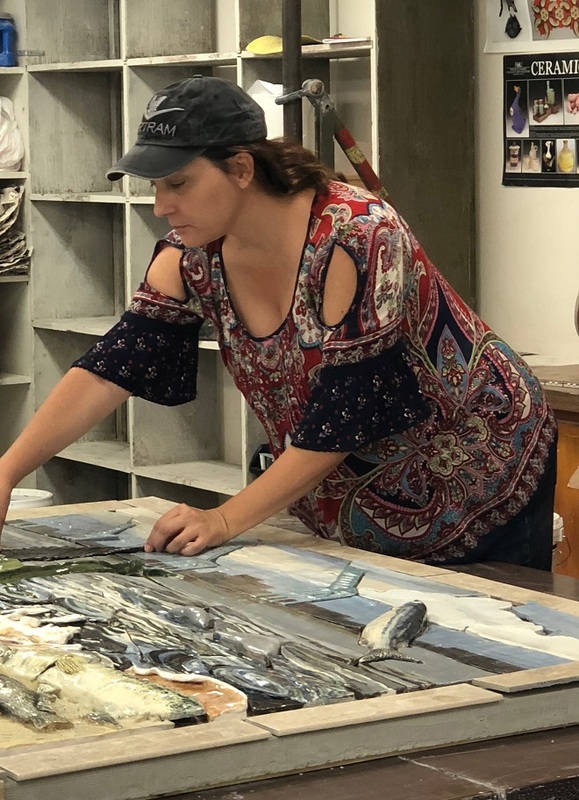 According to Associate Professor of Art Tiffany Leach, the collaboration between students of ceramics and marine science “captures the real world drama of native species and their environment.” The zig-zag of visual elements creates a flow of visual energy. Much of the textural quality in River Wise included clay impressions of actual river contaminates and invasive species. 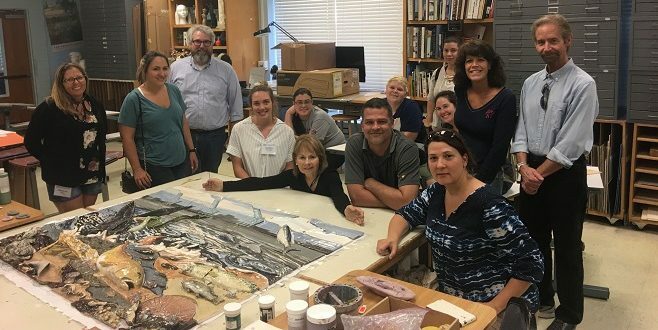 Finally, Gonzalez gives special thanks to Tupa, Leach, Associate Professor of Art Jim Benedict, and MSRI Director Dr. Quint White for their expertise and assistance. The University’s Visual Arts Division has a 12-year history of public art initiatives. The first large-scale work installed on campus was White Palms. Produced in-house, the project involved visiting artist Jonathan Christie, a team of glass professionals, and JU students. The largest work currently on campus, also produced in-house, now hangs in the lobby of Terry Concert Hall. Creative Current, a community project directed by Associate Professor of Glass Brian Frus, engaged a wide variety of stakeholders and is documented in the short film Creative Current: A Legacy in Glass. The next addition for JU will, once again, step into the surrounding community. The University and the Cultural Council of Greater Jacksonville seek artists to design a large scale site-specific work. The site is a soon-to-be constructed roundabout at the intersection of University Boulevard and Merrill Road. The roundabout sculpture will become a landmark for the University and Arlington. For details about eligibility or to apply as an artist (or group), visit https://www.ju.edu/roundaboutart/. Submission deadline is September 30, 2018. 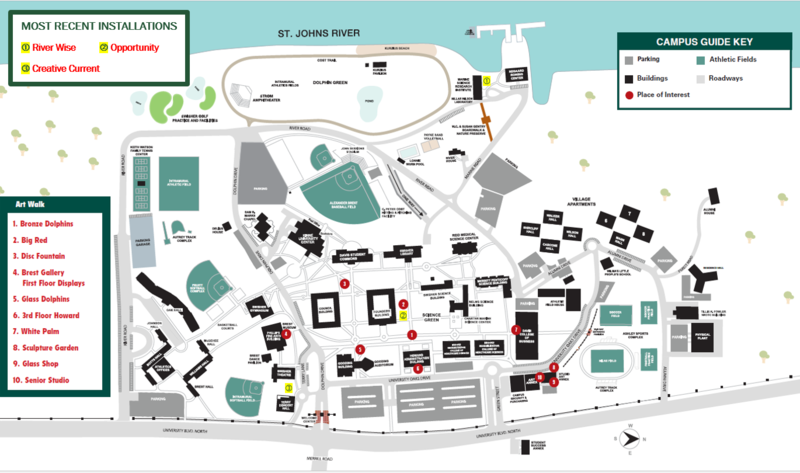 Click image above for art walk map. 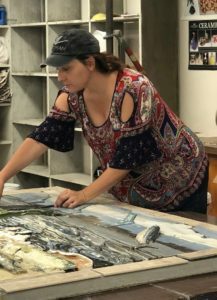 For more information about Jacksonville University’s College of Fine Arts, visit https://www.ju.edu/cfa, and for information on the Marine Research Science Institute, visit https://www.ju.edu/msri. 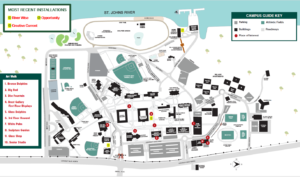 To find locations mentioned above, visit JU’s online campus map. TODAY IN HISTORY… on August 29, 1935, The Federal Art Project (1935–43), part of President Franklin D. Roosevelt’s New Deal, began. The initiative funded and facilitated visual arts projects across the nation, including the aggressive installation of public art. Under the Works Progress Administration (WPA), this relief measure fostered American creativity through a wide variety of mediums. The WPA also established more than 100 public access art centers and kept the families of roughly 10,000 artists and craftsmen employed during the Great Depression.